WilmerHale's Palo Alto office has been named among the Bay Area's "Top Workplaces" by Bay Area News. Since its opening in 2005, the firm's Palo Alto office has grown to nearly 70 attorneys who practice in a wide range of areas, including litigation, corporate, securities, intellectual property, technology licensing and fund formation. "As we continue to expand our team, I am confident that we will maintain our reputation as one of the Bay Area's best places to work," said Mark Selwyn, partner-in-charge of the WilmerHale Palo Alto office. "Excellence is part of our culture firmwide and we accomplish great things by caring for our people and clients." Each year Bay Area News hosts the "Top Workplaces" survey, which ranks the top companies in the area. Companies are selected based on results from an employee survey measuring local and overall leadership, compensation and training, workplace flexibility and diversity. Each "top workplace" was honored during a June 12 award luncheon at the Computer History Museum in Mountain View, California. 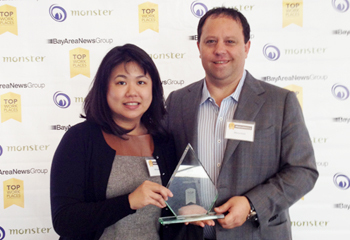 Palo Alto Legal Personnel and Recruitment Manager Nancy Lam and Partner Mark Flanagan accept the "Top Workplaces" award during the June 12 ceremony in the Bay Area.